Increase productivity, accuracy and quality with the HoopMaster Hooping System. The patented features of this system makes hooping easy to learn, faster to use and achieve more consistent results. The HoopMaster is custom made to your hoops so there is no hardware to adjust. The fixture arms hold the tubular hoops perfectly square with the worksurface and directly over the lower ring. 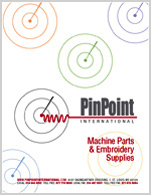 Self-aligning pins allow for fast and accurate placement when changing embroidery location or hoop size. Number and letter grids assist to document embroidery placement for repeat orders. Simple in design and built to withstand the commercial environment. HoopMaster Large Jacket Back Fixture - Hoops over 12" x 12"